Usually, the first rehearsal for a new season is a straightforward affair. We make announcements, introduce new musicians and staff and get our collective chops together. Such was not the case in Detroit on a sunny Thursday morning. We generally start the season with a series of free concerts throughout the community, made possible by the generous support of the DTE Energy Foundation. The repertoire comprises shorter pieces that we know very well, so the idea is to just play through the works and make a few adjustments as needed. But September 24, 2015 will go down as the most inspirational first rehearsal for the majority of those present in Orchestra Hall. For the past two years, the DSO staff, board and musicians have participated in a day of service at the Children’s Hospital of Michigan. Last fall I had the opportunity to join them, and I stood in admiration of not only these brave patients fighting cancer or other illnesses, but also their caregivers, who completely devote themselves to making positive memories with these children. Throughout the year, DSO musicians perform in the hospital lobby and provide live music during group sessions alongside such music therapists as Laura Duda, formerly of Children’s Hospital of Michigan and now the manager of community engagement for the DSO. Earlier this year, in collaboration with Laura, the DSO began planning a proactive initiative to make our music more accessible to people with special needs. For this first rehearsal, we had made arrangements for approximately 20 such individuals to attend, mostly from Glen Peters School in the Macomb Intermediate School District and the Children’s Hospital of Michigan. The young people who visited us came with parents, teachers, paraprofessionals and friends. Many sat close to the stage. After a few introductory remarks, we began with Leroy Anderson’s “Bugler’s Holiday.” Most of our guests seemed to recognize the sound of the trumpets. Following that, we got everyone involved in the same composer’s “Waltzing Cat.” It was difficult to tell how many in our audience actually meowed along with the orchestra, but they did laugh when the imitation of a barking dog from three musicians came roaring through at the end. This past summer, these students from Glen Peters School lost one of their own, a young man named Nathan who was cared for by staff at the Children’s Hospital of Michigan. We learned that Nathan loved the tambourine, and two of our percussionists, Joseph Becker and Andrés Pichardo-Rosenthal, came to the front of the stage and demonstrated all the things that this instrument can do. Nathan’s parents were in the audience, and we dedicated the rehearsal to the memory of their son as a gesture that we hope provided them some degree of solace. Next up was the title music from Star Wars. At this point, it was difficult to know how well we were truly communicating with the young people. However, that all changed with the last selection. At each of our community concerts, we select a member of the audience to lead “The Stars and Stripes Forever.” This time we invited a boy with autism named Connor who, with the help of his father, joined us onstage. When he stepped onto the podium, he was hunched over and clutching a security pillow with both hands. His dad tried to encourage him to stand up straight, but the boy seemed to retreat. 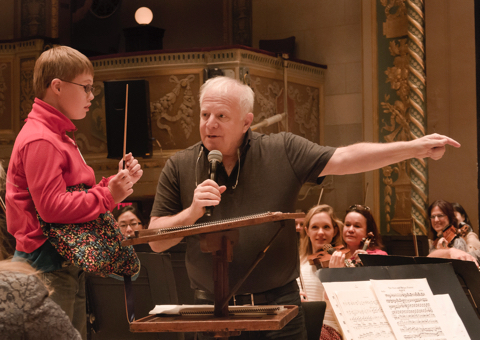 Then I said to Connor that we really wanted him to conduct, and that meant that the orchestra needed to see him. All of a sudden, Connor stood upright and looked for his favorite instrument, the trumpet, played by Hunter Eberly, who rose to his feet to welcome him. I placed a baton in Connor’s hand and helped show him how to beat time. Together we gave the downbeat, and the march began. The consummate joy on this young man’s face, the tears coming from members of the orchestra and the sheer realization that music does make a difference has never been so present as it was for these three minutes or so. On his own, Connor released his pillow, dropping it to the floor, and let the sound of the orchestra overtake his entire body. By the time the music ended, we all had been transformed. As musicians, we know that we alter people’s lives, but not in this palpable way, both in physical and emotional terms. It was a moment in time that will replay itself over and over in my mind. I am certain that the same thoughts will be in the heads of our musicians. And young Connor, well, we do not know how this experience will affect him. But for a little while, he was the king of the world. We could not ask for a braver leader.